Homemade Pineapple upside down cake recipe is one of my all-time favorite cake recipes. No matter how many times I make this pineapple cake, it never lasts more than an hour on my shelf. And today, I am going to help you make pineapple upside down cake on a gas stove. For people who have been looking for making their cakes without an oven, this is a go-to recipe for them. 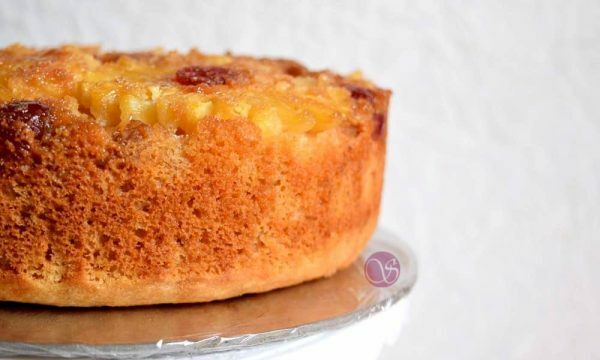 Pineapple upside down cake is a classic American single layer cake. The pineapple upside cake looks extraordinary beautiful after it is baked and inverted. Needless to say, any frosting or coating is unwarranted. Fresh Pineapple upside down cake gives a strong competition to my Apple Pie recipe at my home. I love both of them. The upside down desserts are neither new nor native to America. In fact, the French Tarte Tatin, one of the most celebrated French dessert, is an early 20th-century upside-down apple tart. In 1917 Ida Allen wrote “Mrs. Allen’s Cook Book” and registered four upside-down pie recipes. In the early 1920s, emerged the caramelized fruit bottom – upside-down cake. The earliest record of “Upside Down Cake” appeared in 1923, including the March 15, 1923, issue of the Syracuse Herald. The earlier recipes were fruit arranged on top of brown sugar syrup in an iron skillet. I wanted to make a healthier version of this classic Pineapple upside down cake. So instead of using all-purpose flour, I used whole wheat flour. Had left-over condensed milk and I used it in this recipe. Baking powder and baking soda acted as the leavening agents. Added milk and vinegar to replace the necessity of egg in the recipe. I have used all common ingredients, generally available in all types of kitchen. You can make this easy pineapple cake at home at the time of your choice. Print the recipe card, stick it on your refrigerator and let’s get started. Please follow the recipe word-to-word. This is my tried and tested recipe. Any change in the recipe may change the results and we may not be able to find the reason for failure. 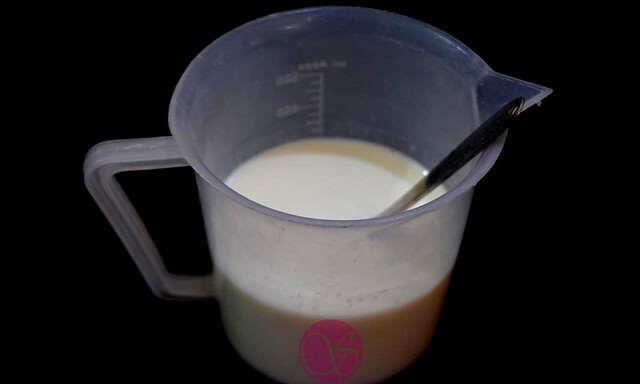 Mix milk, vanilla essence and vinegar in a mixing jar and keep it aside. Meanwhile, keep a heavy vessel on the gas stove. I have used a deep frying pan (Kadai). 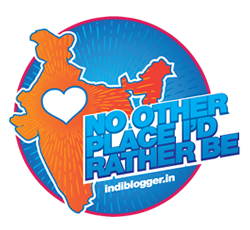 You may feel free to use a pressure cooker or Idli Maker. Switch on the flame. Put salt into it and place a metallic stand on salt to avoid direct contact with the baking pan with salt. Close the lid and continue to heat on medium flame. This will work like a preheated oven. TIP: Salt helps to maintain the temperature and absorbs the extra moisture while baking. 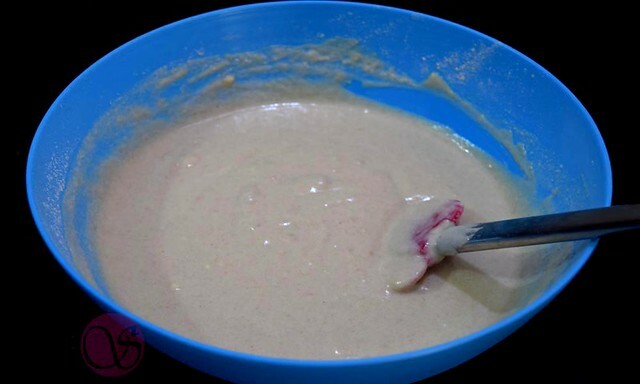 In a large mixing bowl add condensed milk, oil, sugar, and butter. Whisk all of them together until they become fluffy and creamy. I used an electric whisker for this. However, you can use regular hand-whisker too. TIP: Butter will improve the richness of the cake and oil will help in keeping the cake moist. Using a sifter, sieve flour, baking powder, baking soda, and salt. Remove the unwanted particles from the ingredients. Helps in even mixing of the dry ingredients. 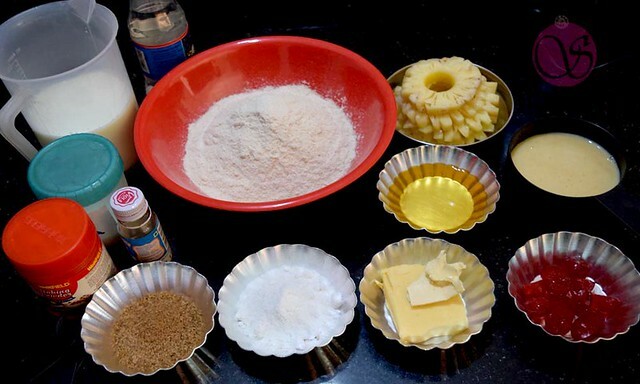 TIP: For eggless baking, sifting plays an important role and helps in keeping your bakes light and fluffy. 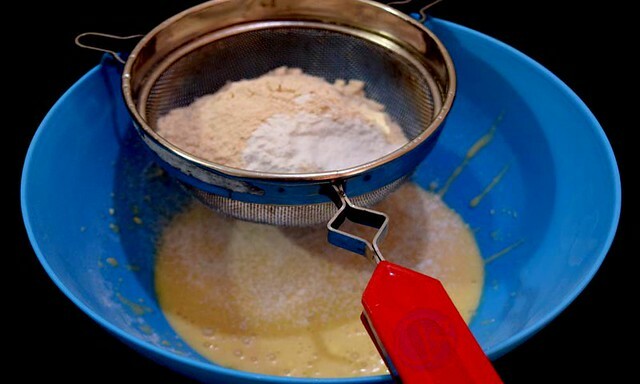 Using a spatula, fold all the dry ingredients into wet ingredients and add milk solution to make a smooth batter. Ensure that there are no lumps in the batter. Use an electric whisker, if you feel like. 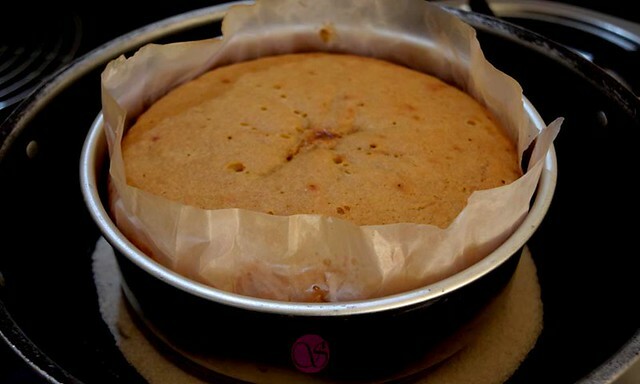 Line a cake pan with parchment paper. Sprinkle some brown sugar at the base of the pan. Place pineapple slices and cherry as shown in the picture below. For this recipe, I have used 7” cake pan. Pour the batter over the pineapple slices and tap the tin on counter to release air bubbles. The tapping on the counter helps to avoid cracks or big air pockets in the cake. 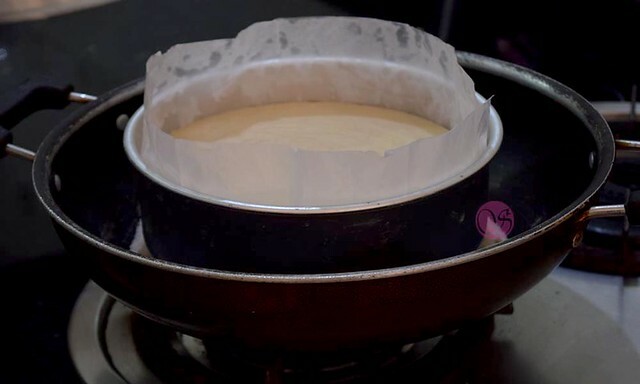 Place this baking tin on the stand (places inside vessel on a gas stove) and close the lid. Let it bake on a medium flame for about 40 minutes or until it passes the toothpick test. Once the cake is completely baked, switch off the flame and take out the baking tin. Let it rest for 5 minutes and then demould the cake. Remove the parchment paper. The caramelized sugar and buttery pineapple will create a brown-sugared juicy topping on top of the cake. The cake looks gorgeous when you flip it upside down. Slice it, serve it and fall in love! This classic old-fashioned pineapple upside down cake is an amazing cake that has stunning looks. This moist and flavorful has a topping of pineapple slices and cherries. 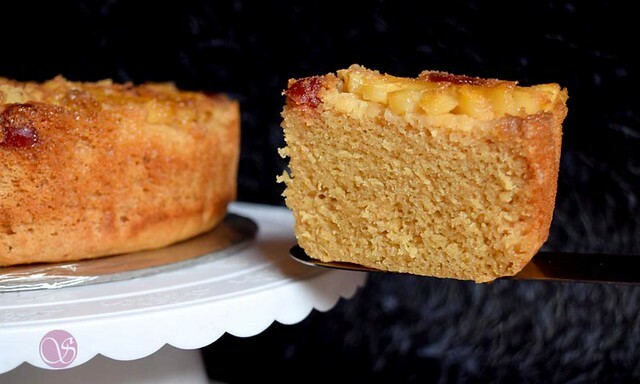 Pineapple upside down cake is an Americans favorite cake for a century. Meanwhile, keep a heavy vessel on the gas stove. I have used deep frying pan (Kadai). Switch on the flame. Put salt into it and place a metallic stand on salt to avoid direct contact of baking pan with salt. Close the lid and continue to heat on medium flame. For batter, Take a large missing bowl. Add condensed milk, oil, sugar, and butter. Whisk all the ingredients. Using a spatula, fold all the dry ingredients into wet ingredients. 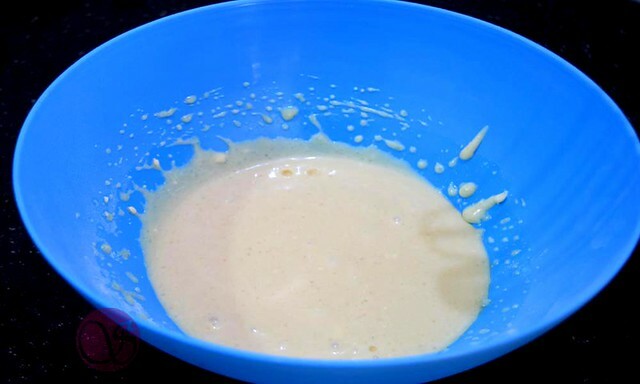 Add milk solution to the batter and make a smooth batter. Line a 7 inches pan with parchment paper. Sprinkle brown sugar at the base of the pan. Place pineapple slices and cherry. Pour the batter over the pineapple slices and tap the tin on counter to release air bubbles. 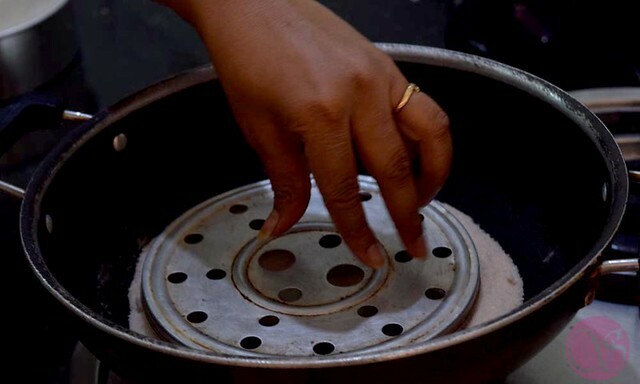 Once the cake is completely baked, switch off the flame and take out the baking tin. Let it rest for 5 minutes. Demould the cake. Remove the parchment paper. Your Pineapple upside down cake with healthy twist is ready to serve. Do not skip to sift the dry ingredients. 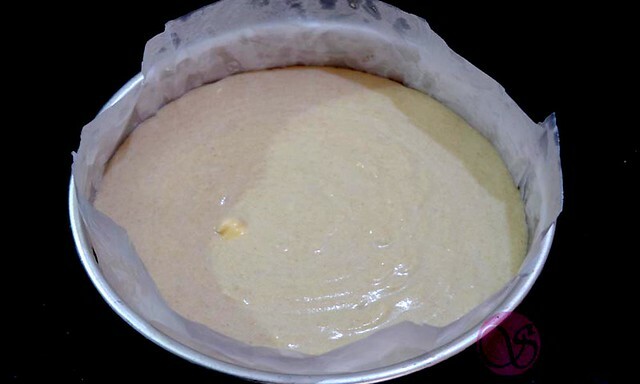 The batter of the cake should be of pouring consistency and there should be no lumps. Baking powder and Baking soda should be in their “Best to use” time period. Always prefer to check the ingredient before baking to avoid waste later on. Use parchment paper for easy demoulding. After baking demould the cake else the base will be soggy. This is a tried and tested recipe. Change of any ingredient can change the end product. To bake this cake in oven, bake it at 180 °C for 30 minutes or until it passes the toothpick test. To bake it in Convection mode, bake it at 160 °C for 30 min. One thing i need to ask that any substitute of condensed milk?? I have not tried the recipe with any other substitute so cannot comment. Your blog is great help..
Any option for condensed milk in recipe..? I haven’t tried the recipe with any other alternatives, so will not be able to comment. One issue I had though was it was slightly sticky and didn’t hold up for the next day, turning soggy. What could have led to that? Most likely you have stored the cake in a container while it was still hot/warm. You are welcome 🙂 I always try to bake first as per the recipe and then change things the next time. So planning to try it as is for now. Will update you when I make it with fresh pineapple. A general query I had while trying to procure items for this recipe. How do we adjust ingredient measurements for a different cake pan size from a given recipe? It comes with practice Ramya. Ramya you can use fresh pineapple for garnishing however all the fruits and vegetables if kept in raw form, release water. So it can impact the texture of your cake and icing ( if any). Feel free to experiment with the recipe and share with us too. I would love to hear from you. I always like taste if pineapple so want to try this recipe next week. 1) pineapple must be over ripped? 2) may I use milk powder in place of condensed milk? If yes then how much? And then how to adjust wet ingredients? 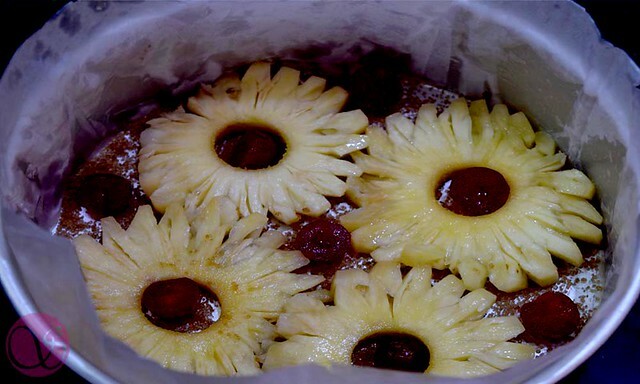 3) if want to bake in microwave convection mode then also need to ur pineapple and cherry at bottom? 1. Over ripped pineapple is not mandatory. 2. I haven’t experimented this recipe with milk powder so no suggestions on it for now. 3. 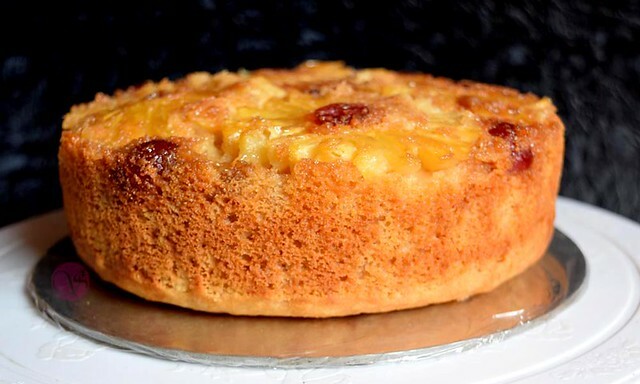 Pineapple upside down cake can only be made by keeping pineapple and cherries at the bottom. Microwave Convection or OTG has no impact.